Yesterday Pakistan, today Sri Lanka, tomorrow who? I usually keep myself away from controversies, especially match-fixing in cricket. I leave that to News of the World and other papers who relish printing such items. However, when a former Test captain says there was match-fixing, I stop burying my head in the sand, ala an ostrich, and look up. I refer to Hashan Tillakaratne’s claim that match-fixing has been going on in Sri Lanka for two decades. According to a Daily Mirror website: “Tillakaratne, who led Sri Lanka in ten Tests between 2003 and 2004 said that he could vouch that match-fixing has been a problem in Sri Lanka’s cricket since 1992. “I can tell this in agreement with my conscience. Match-fixing is not something that started happening yesterday or today. According to my knowledge, it happened since 1992. I say this with great responsibility. I am not saying that this match [the 2011 World Cup final] was fixed. But anyway match-fixing is something which has been in this country over a period of time. This has spread like cancer today,” Tillakaratne added. But when, Mr Tillakaratne? If you are responsible, please name names. He goes on: “This situation was always there. When it came out from time to time, it was quietly swept under the carpet. If someone doesn’t intervene and stop this menace within another two-three years in this country, with these politics, with these corrupt administrators, I believe this country won’t be second to Pakistan in the near future” added the cricketer-turned-politician. He refers to the 2011 World Cup final on 2 April. “Why was Mendis removed to put another spinner, Kapugedara was never among runs but he was chosen to replace Chamara Silva. It is not fair, is it?” he questions. “This has been happening since 1992 and I know all the people who are connected to it,” the website quotes him. So why was he silent for 19 years? Another former Sri Lanka captain, Arjuna Ranatunga, may come forward to substantiate the match-fixing allegations made by his former teammate Tillekaratne, according to journalist Bipin Dani in Daily Mirror, Sri Lanka and in Mid-Day, India. 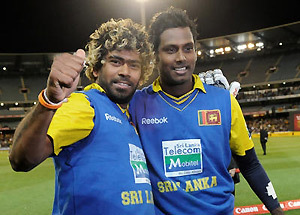 Ranatunga is known to Australians as the heavyweight Sri Lankan captain who defended Muttiah Muralitharan during the chucking controversy in 1990s and got on Ian Healy’s nose. “I am planning to hold press conference in Sri Lanka next week and will reveal more details on this,” Ranatunga revealed to Dani exclusively from Colombo on Sunday. Ranatunga was Tillakaratne’s captain in 1992. Interestingly, both players now sit together in opposition political parties. Ranatunga, the World Cup-winning captain in 1996, also headed the Sri Lanka Cricket Board in 2008. In the meantime, another former Sri Lanka teammate didn’t rule out the possibility of the 1991 Asia Cup matches being fixed. “I am suspicious about at least two Asia Cup matches”, he said anonymously. “Look at the results of the India-Sri Lanka match in Cuttack, where Sri Lanka won by 36 runs and the Kolkata final which was won by India. How on earth could Sri Lanka have won the Cuttack match before losing in the final? “Sri Lankan players had no money then. Only the Indian bookies used to approach them”, he added. When specifically asked why he did not disclose this for twenty years, the ex-player added: “the truth would not have been out [by me] even now had this not been revealed by Tillakaratne. Three former players, Sanath Jayasuriya, Roshan Mahanama (now on ICC’s elite panel of match referees) and Asanka Gurusinha, were reported to have been approached by an Indian bookie in 1992 during one of the Test matches of the home series against Australia, according to Dani. They all turned down the offer and reported the matter to the then-former Board chief, Tyronne Fernando, who passed away in 2008. There was no Anti-Corruption Unit of the ICC then. The plot is thickening. So far it has been Pakistan. Now it could be Sri Lanka. Which country’s player/s will come out from their closet in future? There have been many inexplicable and shock defeats in the World Cup since 1999.